From a family of traditional musicians (his father and uncle were both fiddlers), Éric Favreau has spent a great deal of time playing with other fiddlers, learning their repertoire and studying their styles. He has explored many sources, including music archives, and has made his own field recordings, accumulating and developing a rich and fascinating repertoire. Over the years, he has garnered a profound understanding and vast knowledge of Québécois traditional music. 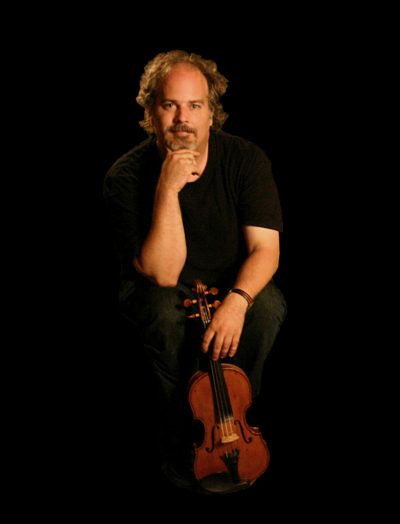 Éric is regularly invited to teach Master Classes at US events and traditional music camps, including American Fiddle Tunes (WA), Swannanoa Gathering (NC), Ashokan Fiddle and Dance Camp (NY), Maine Fiddle Camp (ME) and has performed and taught at the North Atlantic Fiddle Convention in Ireland and Scotland. He has broad experience on both the North American and European music scene both as a solo artists and with the group Entourloupe, and has recorded two solo albums. Reel à Deux, recorded with fiddler Mario Landry, is a reference for Québec traditional fiddling. He also recorded three albums with Entourloupe (La St-Berdondaine, Les choux pis des melons, Épilogue) and can be heard on at least twenty others. He performs with the group Tidal Wave, considered by many to be one of the best dance bands for traditional called dances. Their album Marche du St-Laurent was a finalist at the 2011 Canadian Folk Music Awards in the category Traditional Instrumental Abum of the Year. He his a consumate entertainer/educator, specializing in the Introduction to traditional music in Québec’s public school system under the auspices of the Minister of Education. He also teaches traditional fiddle and the history of traditional music at the Cégèp (junior college) in Joliette, Québec.